To offer your hearts, hands and leadership skills to The Salvation Army in your area, contact your local branch by entering your zip code below. Advisory Board members are community representatives who provide valuable assistance and advice in support of The Salvation Army’s mission to “preach the Gospel of Jesus Christ and meet human needs in His name without discrimination”. The Salvation Army relies heavily on board members’ advice and community outreach, and their ability to financially and prayerfully support the programs that are Doing the Most Good for those in the most need. These representatives are of different age groups, races, religions, interests, and expertise. The Association offers all who support The Salvation Army in a particular community an opportunity to associate with it and with each other to increase the understanding and support of The Salvation Army by the general public. The officers of the advisory board are exofficio the officers of the association. The Women's Auxiliary is organized to promote the purposes of a particular headquarters, institution or program of The Salvation Army. Its activities may include special fund-raising through approved projects, furnishing volunteer workers, assistance in hospitals, operation of canteens, distribution of food and clothing, staffing of emergency shelters, leadership in group work, visitation of hospital patients, and many other activities. The Advisory Council plans, advises and generally assists the officers and employees responsible for the operation of the service program or institution. The council looks to the advisory board for coordination of fund-raising and community relations. The Red Kettle Club is an opportunity for middle and high school students across America to serve the less fortunate of their communities. 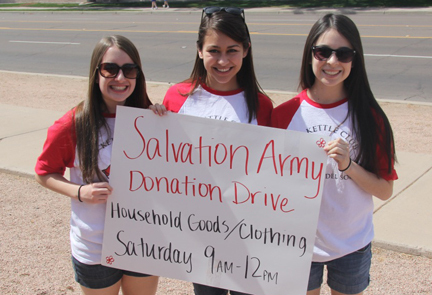 While the name denotes support of the popular red kettles and holiday bell-ringing, students forming clubs are encouraged to continue the spirit of The Salvation Army’s mission by sponsoring various events throughout the school year to help those in need. Echelon is a community of diverse young adults, ages 21 to 35, collectively rising up to serve The Salvation Army through fellowship and networking, donations and fundraising, and service and volunteering. 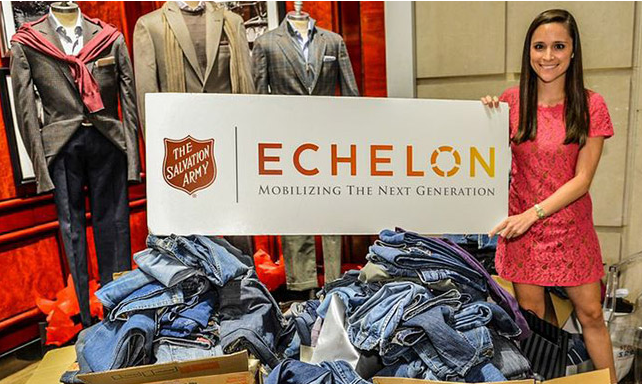 Echelon was founded in 2010 in Dallas, Texas and has since been branded as the National Young Adult Auxiliary of The Salvation Army. Visit http://salvationarmyechelon.org for more information and ways to join. The Service Unit Committee has a function similar to that of an advisory board, but operates in communities in where there is no Salvation Army facility. The service unit committee also acts as the agent for The Salvation Army in raising funds, dispensing emergency and supplemental aid to individuals and families, and making referrals to regional and state services. The State/Divisional Advisory Conference, with membership drawn largely from advisory boards and service unit committees in the state or division, and with members at large, is concerned with the regional and statewide services of The Salvation Army.